The Tardun hat  Is it art imitating nature or nature imitating art? EDMUND RICE SCHOOLS AND MINISTRIES around the world celebrated Blessed Edmund Rice Day on 5th May. 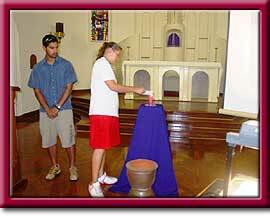 In our neck of the woods many schools were just resuming the new term and it was an appropriate way to start with special liturgies. Probably the largest event in Holy Spirit Province was a Mass held at St Francis Xavier Cathedral in Adelaide. 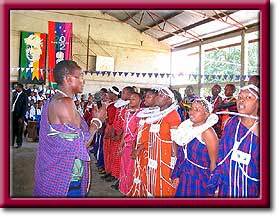 Unfortunately we haven't been able to find any photos of the celebrations but have included one from an earlier celebration in April at Edmund Rice Sinon Secondary School at Arusha, Tanzania which might serve to illustrate how diverse the Edmund Rice Network has now become around the world. Here are excerpts from the newsletters of CBC Adelaide, St Paul's College and Rostrevor which give some flavour of the local celebrations. 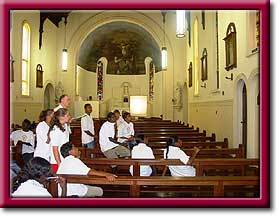 Mass at St Francis Xavier Cathedral This term is again a very busy one and our special events begin immediately. Tomorrow, is the Feast of Blessed Edmund Rice and we are celebrating our Mass for all members of the Edmund Rice family, at St Francis Xavier Cathedral at 5.45p.m. We will follow the normal path of a late start for all Senior School classes, with classes beginning at 2.00p.m. Attendance at the Mass is compulsory for all Senior School students and staff. The Junior School classes will follow their normal schedule and attendance is voluntary for all Junior School students and staff. Mass should finish at approximately 7.15p.m. and students will be dismissed from The Cathedral. Parents are asked to please not double rank outside of The Cathedral to collect your sons. Feast of Edmund Rice Today we have celebrated the Feast of Edmund Rice, founder of the Christian Brothers. There was a special liturgy in the morning, followed by activities and events organised by our Youth Workers, Jo Ashcroft and Rosa Irranca, and the College Captains. The money raised from today's activities will go to supporting Edmund Rice Camps, Engosengui Christian Brothers School in Arusha, Tanzania and the Christian Brothers work in East Timor. When we reflect on the fact that Edmund's mission was to provide education for the poor Catholic boys in Ireland in the early 19th century, the recipients of the school's fund raising are both appropriate and symbolic of the growth of Edmund Rice education during the past 203 years. Congratulations to the students and staff who so enthusiastically supported today. Tonight the College Captains and I will be attending the CBC Mass at St Francis Xavier's Cathedral. Edmund Rice Mass and Memorial Garden We were all very proud of the involvement of the Junior School boys in last week's Mass and a special thank you to the Reception Classes who led the reflection after communion with the Song of Blessing. A number of the Reception boys came back to the Chapel that night to participate in the Memorial Garden Blessing and I thank them and their families for this. Thank you to all the families who supported our Unfair Day Activities as well. The Junior School boys entered this day with great spirit and overall the College raised over $8,500 which will make its way with the next Pilgrim group to our charities in India. 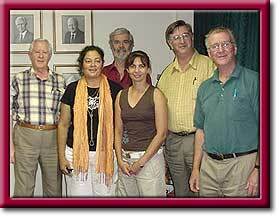 THE NCG:IM is responsible to the Brothers' Inter-Province Leadership Committee (ILC) for the Promotion of Reconciliation and advancement of Indigenous Peoples through Edmund Rice Ministries around Australia. Pictured (l-r) in the photo are Br Michael Ryan, Ms Kerry Charlton, Br Moy Hitchen, Ms Kylie Agale, Br Frank Hennessey and Br Rod Ellyard. Ms Julieanne Manson was absent. IN PREPARATION for the celebration of Easter, the Year Tens had the opportunity to hear the story of the last day of Jesus' life before he was crucified, the event which we remembered on Good Friday. To help us with the telling of the story Br Brian Clery, from Aquinas College, happily gave his time to lead the students through what has come to be known as the fourteen "Stations of the Cross". Not only did he tell the story, but he also led the students through a personal reflection of what each station meant, as well as offer a prayer for the students at each station. The students' response to this was to write down something they needed to forgive someone else for and something they were sorry for. With great reverence and respect, one by one they came to the front of the chapel and burnt the piece of paper they had written on to symbolize God forgiving them and them forgiving others. To finish off, the ashes from the burnt paper was ceremoniously sprinkled on the rose garden - the ashes will give nourishment to the roses. This was a very powerful way to demonstrate that our mistakes and our willingness to forgive can bring life. Burning the paper in the chapel and then the ashes were sprinkled on the rose garden. Is it art imitating nature or nature imitating art? 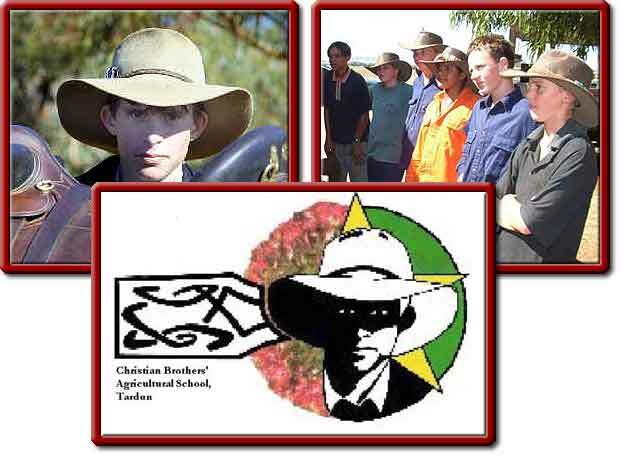 CBAS Tardun has a logo on their newsletter of a young lad in a bushman's hat. Looking at the hats the young men at Tardun wear these days one might wonder if the icon imitates the nature of the place or whether the young men at Tardun are now seeking "to live up to their image"? THE TARDUN WEBSITE [web.cbas.wa.edu.au] has recently been updated and contains a wonderful powerpoint presentation of images of life at the school. [NOTE: It is a large download at 46.5 Mb.] It is little wonder that so many of the Brothers have deep affection for the place and always seem to be "finding excuses" as to why they need to be in Tardun. This place is a little bit of "heaven on earth". Judging from the slide presentation and other photos on the website, the number of life experiences the students at Tardun are exposed to in their time at the school must be second-to-none. 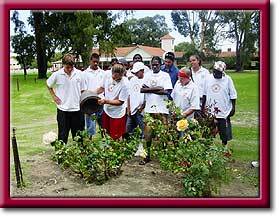 The latest Tardun newsletter also contains news of cooperation with St Paul's College at Gillies Plains in SA. St Paul's deputy, Jim Holmes, as wll as Grant Howarth and Tony Goodwin, have travelled from Adelaide to put in time working at Tardun. Tony Goodwin is a film maker and he's been showing the boys how to take photographs and videos. 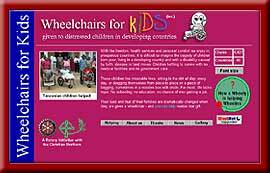 Br Olly Pickett has recently passed yet another milestone with the production of the 5,000 wheelchair for the developed world. That news also provides us with an opportunity to inform you that Olly, Eddy's Carpentry Workshop and the Edmund Rice Centre, Mirrabooka all now have new web addresses. Click any of the logos here to go to the new websites. 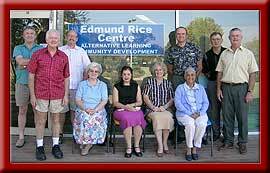 EDMUND RICE ASSOCIATES is a group of about twenty people who gather every second month in Adelaide for reflection, prayer and story sharing. The focus is on Edmund Rice and his inspiration. It is a relaxed and prayerful time with a shared meal and is held at the Brothers community house at Thebarton (103A George St). The meetings for the rest of the year are on: June 15, August 17, October 19 and there will be a gathering in November  details yet to be decided. In addition a non- residential Retreat will again be conducted over the weekend of July 15th -17th Anyone in the Edmund Rice Network is welcome to join us on these occasions. THE PROVINCE LEADERSHIP TEAM has much pleasure in announcing the appointment of Mr Gerry Follows as the new project leader of FAME (Flexible Accredited Mobile Education). Gerry will commence work on May 16, 2005 and will be located for the present time at the Thebarton Province Office in South Australia. This appointment follows a number of very significant processes and decisions since July 2004. Mr David Kelly was appointed by the Province Leadership Team to review the governance and operation of the previous FAME and to make recommendations regarding the wisdom of re-opening FAME and under what circumstances that could successfully be done. David's review work was supported by a reference group. The membership of that group was: Ms Kaylene Barriera [staff member at CBC Adelaide], Mr Jeff Croser [Headmaster Rostrevor College], Mr Tim Deslandes and Ms Terra Lea Ransom [Directors of Community Projects in the Southern Suburbs], Mr Viano Jaksa and Mr Robin Thompson [Learning for Life Board Members], Br Dean McGlaughlin Province Leadership and Br Reg Whitely [Former FAME staff member]. The Leadership Team takes this opportunity to publicly thank these members of the reference group and to commend them and David on the quality of their work. David prepared a detailed report which recommended that FAME be re-opened and focused solely on the original intent of the project. It is envisaged that the conduct of the Flexible Accredited Mobile Education will be delivered eventually on multiple sites with the first site opening in the southern suburbs of Adelaide. The project anticipates expansion into operational sites in the North and North Eastern suburbs within the first three years. Ultimately the FAME structure will seek registration as an educational entity in its own right but in the interim we are negotiating auspice arrangement with other education suppliers in both the Catholic and Government school sector. Gerry's role as Head of the Ministry will be focused on the promotion, management, resourcing and accountability of the project rather than the specific delivery of services on each site. Lucy Tonkin, a teacher associated with the former FAME program in its final weeks has been engaged in developing and documenting the new curriculum since January with David Kelly and Andre Brown, who was one of the people who started the original project. The Province is negotiating with St Paul's College to provide administrative services and support to the new FAME and is very grateful to Peter Shanahan (Principal) and Mary Emery (Board Chair) for their support of this exploration of opportunities for future collaboration. Gerry is Canadian by birth and his employment in Canada and Australia brings extensive management experience in corporations and government to his new role. In Canada he operated as the interface between Provincial Government and the Boards of 102 communities with diverse cultural backgrounds and needs to deliver services and agreed outcomes. Most recently he has been the state manager of a large telecommunications company and throughout his career has held several significant positions as senior strategic manager for large corporations. The Province Leadership Team are delighted to welcome Gerry into the challenging role of revitalising FAME and ensuring that the spirit and mission of Edmund Rice is reflected in our outreach to those school aged young people of Adelaide who have been disenfranchised from the learning environment of traditional schools. We have great confidence in Gerry's ability to lead FAME with commitment and great success and know that he will have the support of all in the Edmund Rice network in Adelaide and across the Province. And guess what? If you managed to get this far you've reached the last page of this newsletter. Best wishes 'til next time. Brian Coyne.